The Aeronavale is the aviation branch of the French Navy. Breguet famously equipped the Aeronavale with the battle-ready Type-20 pilot chronographs, which have been, and still are, ceaselessly coveted, collected, and copied. However, with the new Aeronavale 41-millimeter, Bell & Ross has created a watch suited not to battle garb but to the French Navy’s beautiful gold and blue full dress uniforms. The Aeronavale is not a “real” military watch. In fact, the French Navy had nothing to do with it. Rather, Bell & Ross simply dreamed it up. Bell & Ross can get pretty conceptual this way, with recent examples including their copper-dialed Bellytanker (designed for an imaginary vintage land-speed-record scenario) and their sporty Racing Bird (meant to accompany a computer-generated high-speed plane). On the surface Bell & Ross’ concepts can seem lofty, but I’ve found that the concepts help bring these watches down-to-earth by eliminating the pretense that a mechanical watch is, today, a real tool. When you consider that a life-long American civilian like me regularly wears a watch that Bell & Ross dreamed up to complement the French Navy Air Division’s full dress uniform, the whole enterprise takes on an air of delightfully absurd costuming. But, somehow, overtly acknowledging that we’re all playing dress-up seems to temper the absurdity. But why would I—or anyone for that matter—fall for a watch like the Aeronavale? Typically there’s some personal connection that sets the heart aflame, and I’m sure others who enjoy the Aeronavale will have their own story. For me, it goes back to childhood. One summer when I was around 12, the US Navy’s sailing team borrowed my Dad’s sailboat for a tet-a-tet against a crew of scrappy yahoos from the Buffalo Yacht Club. Predictably, the Navy’s clean-cut sailors breezily command victory. Later that night the Navy Band played the most badass funk—all of them in full dress uniforms like some strange spin-off of The Village People; the horn section lock-stepping to “Ladies’ Night” by Kool & The Gang; the dangerously handsome lead singer flirting with everyone’s wives and daughters. Utterly gobsmacked, Navy-cool has enchanted ever since. Funny, though, that I didn’t fall in love with the Aeronavale’s predecessor, the 42-millimeter BR123 in the same colorway that Bell & Ross released in 2016. That watch has a significantly larger dial, and I felt like a poseur sporting such a huge blue and gold billboard. Thankfully, Bell & Ross has been following the trend toward smaller watches, and this new 41-millimeter 92-V2 Aeronavale is one of the best fitting, most elegant, and properly proportioned watches I own. It delivers just enough Navy-cool. All of the B&R 92-V2 watches run on the BR-CAL.302, an adaptation of the increasingly ubiquitous Sellita SW300-1, which itself is a near-clone of ETA’s 2892. The “-1” indicates that this movement has beefed-up teeth on the gear train, which Sellita claims reduces inaccuracies introduced by shock. Bell & Ross doesn’t disclose whether they’ve made any mechanical upgrades, and the only visible modification is the engraved logo and other subtle touches on the rotor. As with all SW330s, its a-magnetic Nivaflex hairspring oscillates 28,800 times an hour, it includes an Incabloc anti-shock system, and it can store up to 42 hours of power. The movement is visible through a sapphire crystal mounted in the handsome screwed-in case back. The BR-CAL.302 features very light decoration. Being vintage-inspired, the entire case is polished to perfection, its shape traditional and elegant, its connections seamless and sharp. This is high-quality metalwork, as impressive under a loupe as it is at arms length. 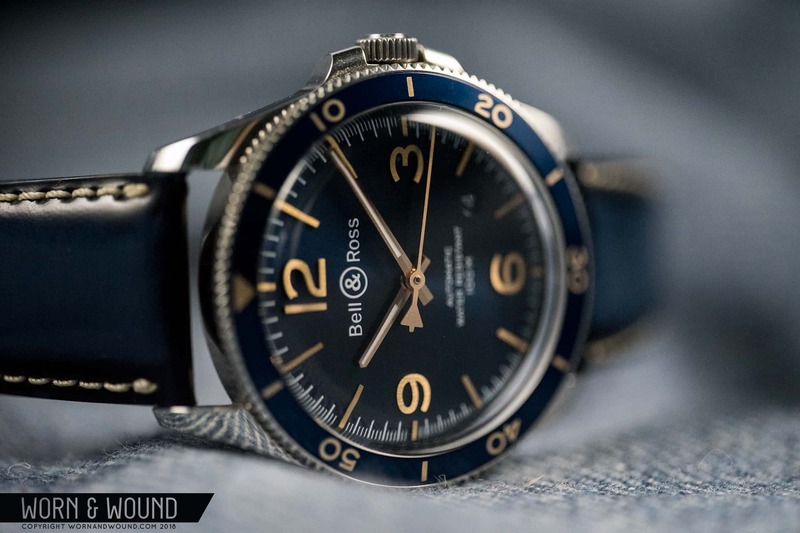 Like all of Bell & Ross’s vintage-inspired pieces, the lugs are long and leave a sizable gap between the strap and the case, which affords a clear view of the excellent connection where the bezel, case, and lugs meet. This can be a contentious detail, but I adore it. The BR-CAL.302 and the handsome mid-case. The crown threads in and out like it’s dipped in butter, and the robust crown guards—which match the case so well that they look like a third pair of lugs—are visually and ergonomically unobtrusive. The crown is signed with the iconic “&” that’s come to stand for Bell & Ross, and even the minute details of that signature exhibit flawless brushing and polishing. The bezel has a polished coin-edge which slightly overhangs the case, thus providing ample grip and a classic look. The bezel clicks 120 times per rotation, and, because the Aeronavale is a flight-oriented watch, the bezel is bi-directional. Though it moves into position with perfect alignment, like most bi-directional bezels there is a bit of play when stationary. The blue anodized aluminum of the bezel insert matches the dial to a tee, and the gold 60-minute markers similarly match the gilt markers on the dial. An excellent sapphire imitation of an acrylic crystal. Tasteful, vintage-inspired lugs holding onto a mil-strap for casual occasions. The curved, anti-reflective sapphire crystal is a thing of true beauty, almost indistinguishable from acrylic other than the deadened sound it produces when I drum on it with my fingernail (acrylic is more resonant than sapphire). The crystal’s curves produce creamy, dreamy visual distortions, and, although neither the edge of the dial nor the tip of the hands curve downward—as so many vintage dials and hands do—at certain viewing angles the crystal’s distortions create the illusion of curvature toward the polished steel rehaut. All told, the Aeronavale’s crystal is among the most convincing sapphire imitations of acrylic I’ve seen. I know I’m supposed to join the chorus lamenting the ills of date apertures placed at 4:30, but I’ve grown to love these discrete, circular date windows. And thank you, Bell & Ross, for not interrupting any of the Aeronavale’s gloriously legible gold numerals and markers with the date aperture (a big pet peeve of mine). On the Aeronavale, the date wheel is rendered in the same radiant blue as the dial, and the numerals are in white paint that matches the minute track, logo, and three lines of spec text on the dial. The Aeronavale is rated to 100-meters of water resistance, so I will SCUBA dive in it, though I can’t recommend doing so to anyone else because watch brands claim that you need a better rating in order to dive deep. The WR rating has me questioning what qualifies as a Dressy Tool Watch, or DTW, a category that Ilya and I, in true Bell & Ross fashion, simply dreamed up. We disqualified rotating bezels as too “tooly,” but because the Aeronavale is dressy enough for full dress military uniforms—arguably the dressiest outfit a person can wear—I am tempted to make an exception and declare the Aeronavale a full-on DTW. The Aeronavale can be dapper and dressy. Attributes that make the Aeronavale so dressy include the fully polished case, the radially brushed blue dial, the vertically-brushed gilt numerals and markers, the dual-tone beveled hands, and the unique “ice-blue” calfskin strap. Tally that all up, and you’ve got quite a fancy presentation. The whole package looks like something you’d wear to meet a dignitary. The dual-tone hands deserve a closer look, as they are brushed on one half and polished on the other. This treatment—which is found on a few watches including some of Mido’s offerings—creates the illusion of a much more deeply beveled hand while also shortening the stack of hands on the central arbor. The visual trick is quite convincing—so convincing that I missed it entirely until Ilya pointed it out. Bell & Ross has skeletonized those hands and filled them with Super-LumiNova, though, as with many of their watches, the small quantity of lume makes it seem like an afterthought. The upshot is that the Bell & Ross made no concessions to lume as they loaded the dial with those vertically brushed gilt numerals and markers. Lastly, the relative lack of lume reinforces the notion that the Aeronavale is more costume than tool. Lume is a bit of an afterthrought. The alternately brushed and polished hands give one the impressions of faceted hands. If you’ve still got doubts about its dress watch status, check out the Aeronavale’s “ice blue” patent leather strap. It fades from deep dark blue at the edges to a muted mid-blue at the center, and the white stitching picks up the white paint on the dial and date disc. I adore this strap, though its something I’d never have leaned toward outside of this context. The signed deployant clasp is mirror-polished like the case, features snail engraving inside the buckle, and it is a cinch to open and close. Deployant clasps on leather are often a bit bulky on the backside of the wrist, and this one is no exception. That bulk doesn’t bother me, however, and it’ll be a personal choice between the steel bracelet (which I’ve only handled in a boutique for a moment), a standard pin-buckle on the leather strap (which is easy enough to convert), or a third-party strap that suits your fancy (which is half the fun). The patent leather strap is quite formal. The Aeronavale dresses down easily on a mil-strap (shown here on one of our ADPT straps). The highly finished deployant clasp. Though I’ve made a strong case for its dressiness, I was delighted to find that the Areonavale dresses down just fine on a mil-strap. During the past couple of sweltering months I’ve had the Aeronavale on navy blue nylon and paired it with everything from shabby old work shirts and tattered khakis for Saturday schluffing to swim trunks and a rash-guard while paddle boarding. The Aeronavale’s versatility keeps this watch on my wrist far more than I had anticipated, and despite owning it for only a couple months, it is already my most worn watch this year.